On August 30, the Little Sisters will hold an open house that will show a glimpse into their life as a Little Sister of the Poor. The event includes a rare tour of the convent, which highlights the Sisters’ living quarters. 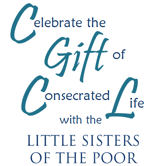 Closing Prayer and Benediction in thanksgiving for the gift of Consecrated Life to follow.